In my previous post, I discussed how one might build a decentralised asset register on top of Bitcoin. However, there is another approach, one taken by mastercoin. There is a very good explanation of how the system works by Vitalik Buterin at Bitcoin magazine. What makes this approach interesting is that it is based on a deep insight: the bitcoin network and the bitcoin currency are not the same thing. The key insight of mastercoin is that you could also build a distributed asset register on top of the network services, without making much use of the bitcoin currency itself. That is: whereas a bitcoin transaction and a colored coin transaction are really the same thing, a mastercoin transaction could have no real conceptual linkage to the underlying bitcoin transaction that happens to carry it. It would, in effect, be a second currency system sitting on the same network infrastructure. Unfortunately, the bitcoin network doesn’t provide the generalised storage facilities that this approach requires and the current mastercoin implementation feels, to me, like a hack. For example, bitcoin addresses are repurposed to represent concepts other than addresses in a really quite unsatisfactory way. An ingenious solution to the problem but still a hack 🙂 This means that they haven’t quite managed to remove the middle box in the diagram above and the result is an uneasy half-way house. 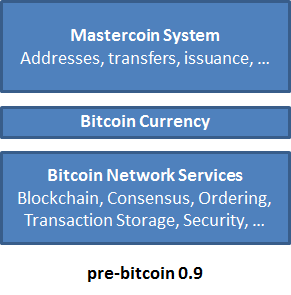 However, once a seemingly minor change to allow 80-bytes of arbitrary data in a bitcoin transaction is introduced in bitcoin 0.9, it may be possible to implement a far more elegant implementation of mastercoin. 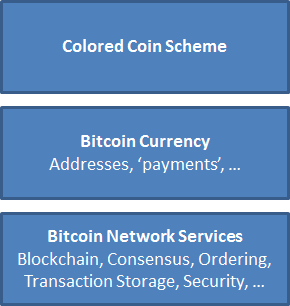 In essence, their architecture might herald a wave of alternative schemes that sit on the core bitcoin network. I have no idea which approach will prevail (economics will no doubt trump architectural purity, as ever!) but it is great to see so much innovation in this space. Hi Richard, and thanks for this interesting article! I just want to share a secret with you and your readers. Mastercoin is not about the technology. It’s a project with a goal and a technology stack, which currently relies on Bitcoin. However, that can be switched out or modified later if needed. Are you saying that Bitcoin could be swapped out for Peercoin, for example, – http://www.ppcoin.org – (a cryptocurrency which requires minimal energy to maintain it’s security, unlike Bitcoin)? Alias, yes, Mastercoin-type technology could be deployed across the Peercoin network (and other crypto currency networks) someday. Bitcoin was chosen obviously because it is the frontrunner with the highest security (from a POW perspective, at least). However, given that Peercoin 0.4 (just being released) is a merge with Bitcoin 0.8 code, currently Peercoin is lacking in the more “elegant” way to store MSC transactions that the author brings up. Yeah, Mastercoin could swap out Bitcoin for Peercoin. I love Peercoin and am invested from the early days. Basically we’re agnostic. Which underlying currency system better supports our needs, that one we’ll choose. FYI we have an open bounty (we haven’t decided how much yet) for researching and documenting why and how we would swap out Bitcoin for another alt.